We’d love your help. Let us know what’s wrong with this preview of The Battle of Bulwark by Del Henderson. Outside of being the sheriff's daughter, Claire Finnes' life was the same as any other 15-year-old. However, recurring nightmares and an encounter with dead civil war soldier send Claire and her friends on a journey that makes her question if those nightmares really were just dreams. As she uncovers the dark history surrounding her small town Claire begins to wonder, can a Outside of being the sheriff's daughter, Claire Finnes' life was the same as any other 15-year-old. However, recurring nightmares and an encounter with dead civil war soldier send Claire and her friends on a journey that makes her question if those nightmares really were just dreams. As she uncovers the dark history surrounding her small town Claire begins to wonder, can a doomed future be changed? To ask other readers questions about The Battle of Bulwark, please sign up. Wow! The Battle Of Bulwark is the Bulwark Anthology Volume Seven and unputdownable it is, as its an exciting fiction story. Soon as I read the first few lines I knew I was going to enjoy it. Here's the first few lines that grabbed my full attention. Fire, Smoke and unwanted destruction swarmed around Claire as she watched the devastation on her hometown of Bulwark from the hilltop just outside of town. Illinois author Del Henderson, a fine mystery/suspense writer, is included in the very successful anthology A BULWARK ANTHOLOGY, an impressive collection of authors responding to the paranormal thriller BULWARK by the well-known and respected author Carole Roman. The variations on the theme of the small town of Bulwark is greatly enhanced by Del’s insertion of historical references that step to the forefront of this fascinating little town. THE BATTLE OF BULWARK is a fine complement to this exciting anthology. The indelible mark of a fine writer has been established! 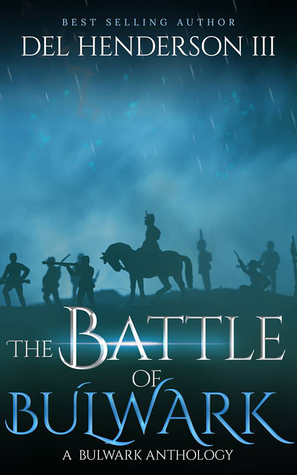 The Battle of Bulwark is the seventh book in the Bulwark Anthology. This book focuses on teenage Claire from the original book, Bulwark. The characters were well built. I also loved the tie-ins with the Civil War. This was a quick and exciting read. I highly recommend this book! I didn't think I would enjoy this installment of the Bulwark Anthology, but I actually did.